Kunstbüchlin, gerechten gründtlichen gebrauchs aller kunstbaren Werckleut. Ertzarbeyt, in un[d] ausserhalb feurs, auss alchimistischem und natürlichem grund … Jede Farben zubereyten, erhalten, bessern und widerbringen. 6 works in 1 volume. Small 4to (19.5 x 16 cm). 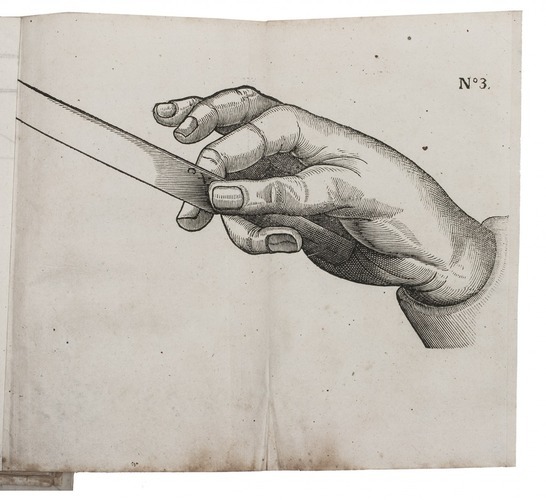 Half vellum (ca. 1730). Ad 1: Third copy located of the undated fourth(?) 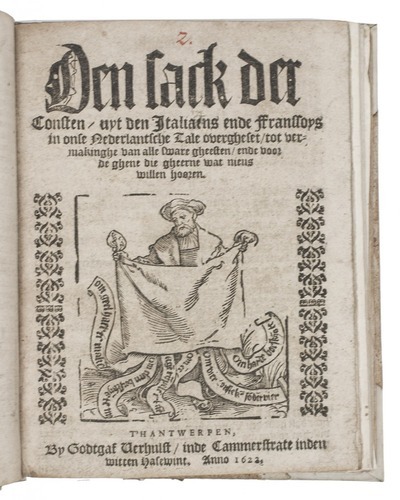 edition of a popular and influential German book of secrets, first published in 1535. All early editions are very rare. "lt … contains vernacular receipts [recté recipes] for tempering iron and steel, etching and colouring metal, removing stains from cloth, making inks, colours and dyes, and for various other chemical preparations. Its material was in part already of considerable antiquity, and it was to have an extensive life-span in printed form, appearing in many editions and translations, in extract and combination with other material, according to Ferguson at least until 1720 ... It was clearly very influential ... Its audience ... consisted of craftsmen and artisans" (Paisey). It of great interest for the history of metallurgy, art history and technological chemistry. 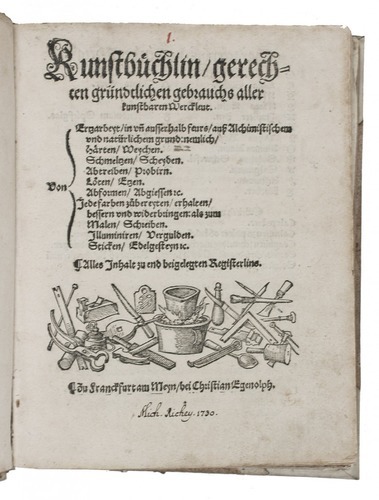 Ad 2: Only copy located of the 1622 edition of the popular Sack der consten, a collection of curious medical recipes based on popular traditional wisdom, first published in 1528. 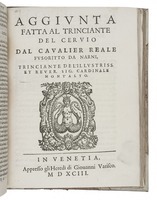 All early editions are extremely rare, those known survive in only one or two copies. It contains remedies for ailments and solutions to other problems concerning drunkenness, night vision, reducing the size of a virgin's breasts, improving the relationship between man and wife, making dogs dance, etc. It closes with 41 similar remedies for animals. Ad 3: Second (or third?) 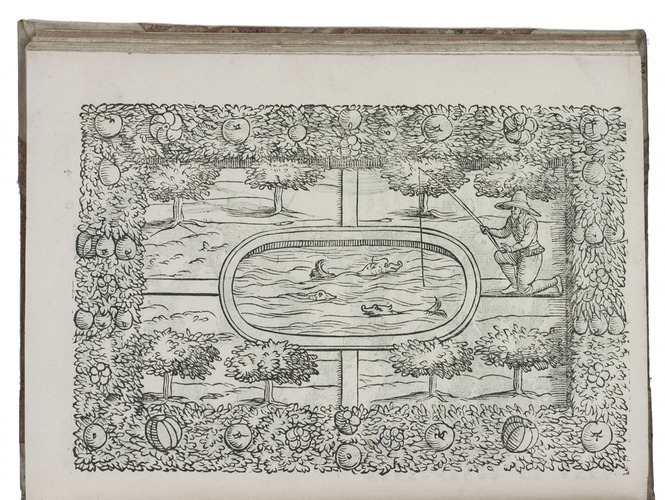 edition, the best illustrated, of an elaborate Italian gastronomic treatise, detailing the carving and serving of meat, fish, fruit, shellfish and fowl. 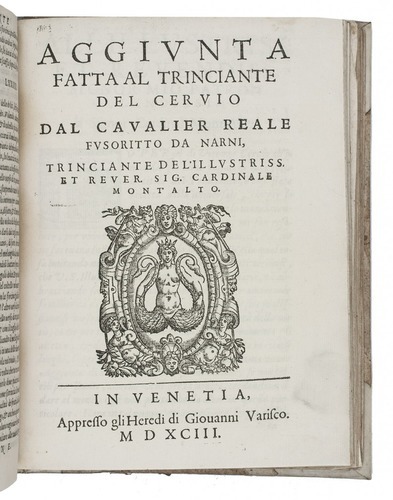 Cervio's work is superior to the essays of his predecessors Romoli and Scappi, making it the most complete Renaissance treatise on the art of culinary carving. It promotes the Italian method of carving, where one holds the food up in the air with a fork and carves it in this posture, transforming the operation into a spectacular performance for the diners to admire. 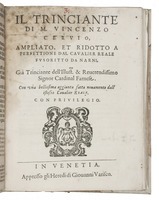 The treatise, moreover, provides "much information about the foods eaten at an Italian court of that period" (Davidson). Lacking 1 woodcut folding plate. 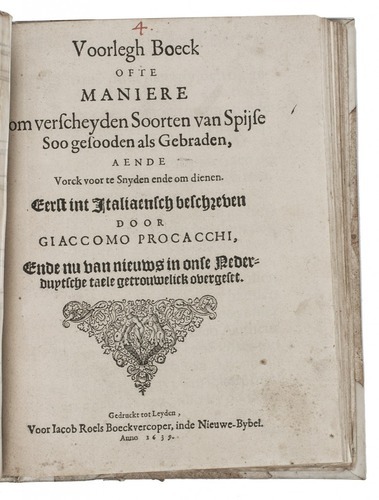 Ad 4: Third copy located of the first Dutch book on carving, translated from the Italian and supposedly first published at Rome in 1601. 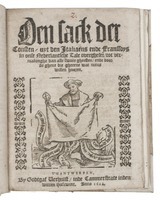 The earliest edition known to survive, however, is the German Trincier, oder Vorleg-Buch (1620). 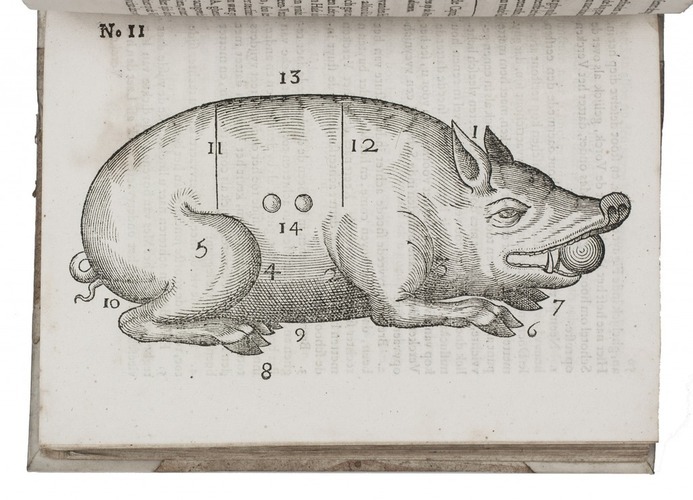 The woodcuts, made after the engravings of the German edition, give excellent models of early carving knives and forks, and curious illustrations of various animals and body parts. 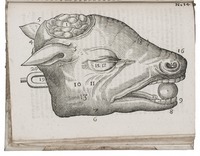 The woodcut of the calf's head is especially well done. 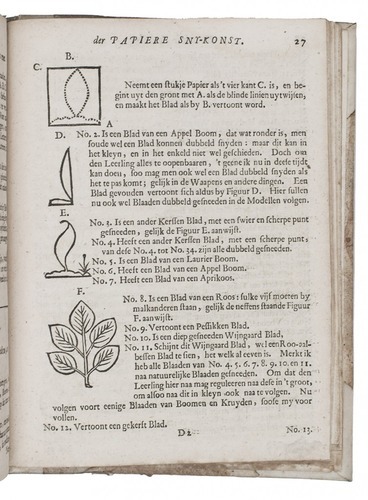 Ad 5: Third copy located of the first and only edition of an early Dutch guide to the art of paper cutting. Paper cutting originated in China, and after the start of mass production of paper in Europe, the art spread over the continent. 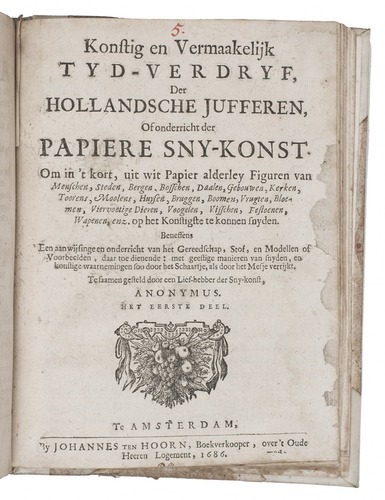 In the second half of the 17th century it became a rage in the Netherlands, leading to the publication of the present manual, specifically intended for Dutch ladies ("Hollandsche jufferen"). The most famous known practitioner was Anna Maria van Schurman (1607-1678), the foremost female scholar of her time. The publication gives information on techniques, materials and examples. 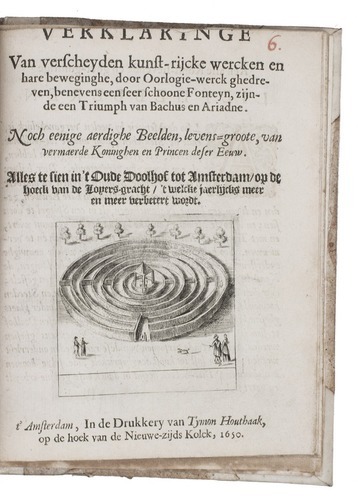 Ad 6: Third copy located of the fourth edition of an illustrated description (intended as souvenir) of the "Oude Doolhof" (literally: old labyrinth) of Amsterdam, a sort of amusement park behind the houses on the south side of the Looiersgracht (with an entry through an alley from the Prinsengracht). It was the first public doolhof, set up by the wine merchant and inn-keeper Vincent Jacobsz. Coster before 1625 (probably after 1614). The Doolhof was a sculpture garden with a labyrinth, exhibiting fountains, sculptures and clockwork automata, showing historical, mythical and biblical figures and spectacles. 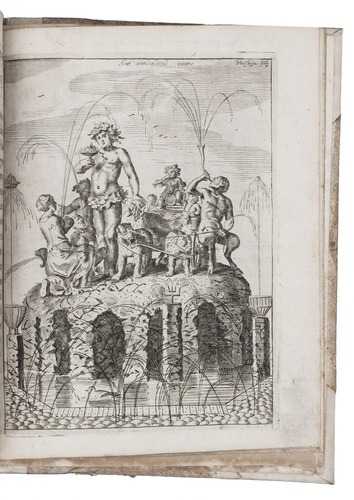 For the present edition a description of a scene showing David and Goliath is added, but unfortunately the corresponding folding engraved plate (introduced in the third edition) is lacking. 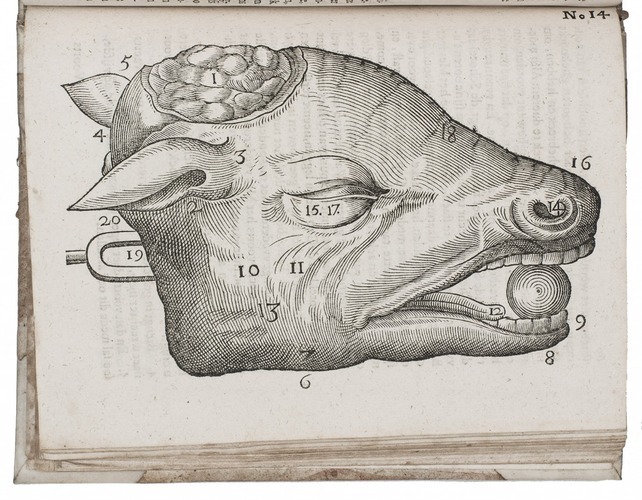 From the library of the German poet and scholar Michael Richey (1678-1761), best known for his Idioticon Hamburgense (1743). With the head of the first word on the title-page of ad 6 shaved, but the volume is further in very good condition, with only some minor thumbing. A remarkable collection of rare popular informative publications, all illustrated. 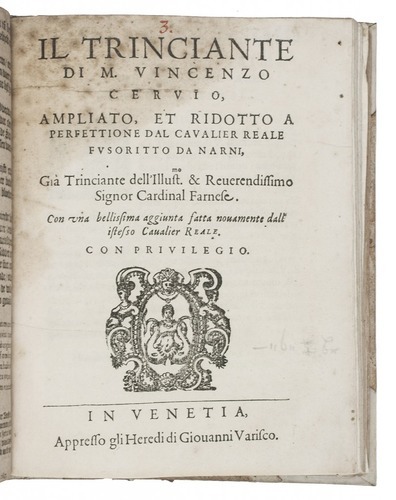 Ad 1: USTC 670344 (2 copies); VD16 R 497 (1 same copy); cf. BMC STC German, p. 478 (1574 ed. ); Brüning, Nächtrage 0194a (first ed. ); Duveen, p. 330 (1616 ed. ); Ferguson, Bib. chem. I, p. 486 (1687 ed. ); Ferguson, Books of secrets I, p. 15; Paisey, “Some sources of the "Kunstbüchlein" of 1535” in: Gutenberg-Jahrbuch LV (1980), pp. 113-117. Ad 2: cf. 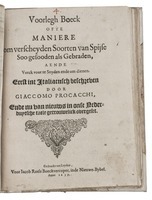 Debaene, Nederlandse volksboeken, p. 262 (1st ed. ); KVK & WorldCat (1 copy of 1603 Antwerp ed. ); NCC (1st ed. 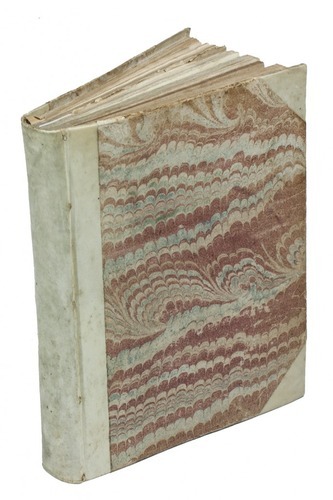 ); Nijhoff & Kronenberg 1843 (1st ed. ); STCV (1 copy of 1610 Brussels ed. 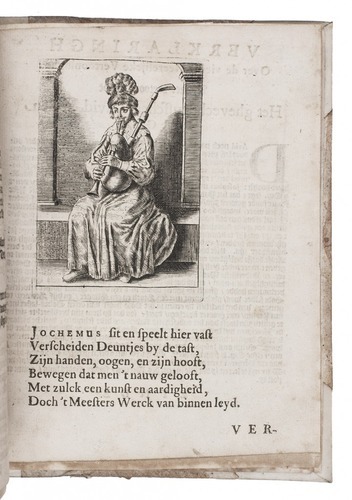 ); UniCat (same copy of 1610 Brussels ed.). Ad 3: Bagnasco 455; Vicaire, p. 159; Westbury, pp. 46-47; cf. Davidson, The Oxford companion to food, p. 156. 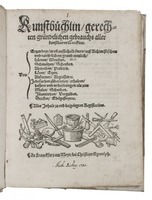 Ad 4: Landwehr, Het Nederlandse kookboek 10; STCN (1 copy); Vicaire, p. 711; Witteveen & Cuperus 5069; cf. 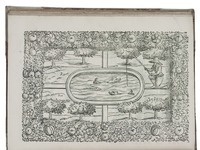 Horn & Arndt 183 (1624 German ed. ); Simon, Bibl. Gastr. 1224 (1621 German ed. ); no Italian original in: Bagnasco; ICCU; Westbury. 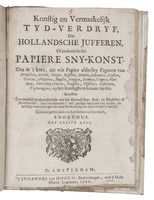 Ad 5: S. Metken, Geschnittenes Papier, p. 18; STCN (1 copy); WorldCat (1 copy). Ad 6: Franken 1375 (note); Meijer, "Het oude doolhof te Amsterdam", in: Oud Holland vol. 1 (1883), pp. 119-135; Spies, De Amsterdamse doolhoven, pp. 70-71; STCN (2 copies).